Pearl of Wisdom loves you, in her fashion. And you love Pearl. SURPRISE! You are to be congratulated on finding this site. This is where Pearl of Wisdom explains it all for you. When All Else Fails, ASK PEARL. Write in with your own concerns or simply read Pearl’s advice to others. It all comes to the same As The Tail Ends. You will know when the time is right. Meanwhile, tell Pearl what is on your heart. Talk to ME. Pearl of Compassion understands all things and will respond. ASK PEARL now! Due to overwhelming popular demand, by readers who don’t have a clue what is going on here, I am including a brief temporal autobiography of ME, Pearl de Sagesse de Sabaduria. I AM A DEAD SQUIRREL WHO KNOWS EVERYTHING and pines to share it with YOU. I lived for 10 years as a non-releasable in So. Cal, and gnawed my way through most of a Merriam-Webster’s English dictionary and around the edges of a LaRousse Spanish/French. Plus, I absorbed vast amounts of information through my 7 senses, tuned beyond anything you can yet imagine. And the rest I make up. In short, in matters vegetable, animal and mineral, I am the very model of a modern psychic squirrel. Croaking only increased my power and lovability factor. You can ASK PEARL anything. Confide in ME, Gentle Reader; unburden your soul. Pearl wants to hear from you, NOW. The big pink human who was my earthly caregiver and is now my channeler is, to put it kindly, a bit of an albatross. I listen to Seth and Abraham complaining but HA! their challenge is nothing compared to ….well, don’t get ME started. Just write to ME. Every category gives you the opportunity. Pick your favorite, or visit them all, and let’s get to know each other. Pearl, it feels like the whole world around me is crazy! Everyone around me has screwed-up priorities, and it seems like human society itself is a mess! So, my question is . . . How can I get my fellow humans to give me money? Because, the way I figure it, having money would make my life more enjoyable in the midst of all this madness, or at the least, I could better afford professional help to deal with it. Right on, Jestress! For ME it’s Filberts but it amounts to the same thing. At least WE have our priorities straight. Just wanted to send good wishes to a fellow Possum & Animal lover. Happy New Year, Pearl! From a big fan and aspiring admirer. Keep living your best life in 2018. And you, as well, Possum Witch. Got my shirt today and LOVE IT! I am so tickled to see that your true spirit of selflessness is shinning through by offering the cosmic soul of the Opossum face time on your T-shirts. You are one step closer to the extinction of your personal ego and oneness with the universe . . . well, not really. I was so enamored by the shirt I forgot about the money I spent . . . oh yes, the money . . .
send ME money and get NOTHING in return. It was so pure. Oddly enough, only a few people obliged and felt the enormous benefit. Others persistently clamored for stuff stuff stuff. They would not be denied. And because Pearl Loves You and is somewhat adaptable under the right circumstances, she provided stuff. You live in a capitalist society and I live in a tree. It’s different. Oh, and BTW, I AM the Universe. O.K., I give up. How do you make milk for a baby goat? I was wondering if I could get some help planting my chicken seeds. I’ve been having a lot of trouble getting them to grow what do you think I should do pearl. What happened to Chicken Boy? No matter. Chicken seeds are tricky as you’re never sure if you are planting chickens or eggs. Love to hear that. Am thinking of starting an all squirrel band. I am so confused! My thoughts return to a Scot that busies himself mainly in the country doing what good he can. He is of little words. Is it best then for me to busy myself as well bc if the stars align they will one day? Or would the great Pearl advise that better to be present and stay present. Thank you for your healing words of wisdom. My advice is to busy yourself doing Duchess stuff and if something better comes along, Mazel Tov! What are your thoughts on snakes? Also, how do you feel about the current Mercury Retrograde? Snakes~ Don’t think about them much. They are one of the symbols for the human Goddess, whereas squirrels, specifically ME, am the symbol for the Universal Goddess. Mercury Retrograde is a pain in my patute, especially during baby season when all those precious little beings are falling out of trees because Mama can’t get home. Sad Sad Sad. I can fix most everything but this requires concerted human help. Find those babies and get them to a rehabber while there is still time. Protect Mother Squirrel and all Her children. Just wondering where you got the inspiration for your possum videos? I saw your possum politics video and I think you should run for president. Ya got my vote :). Writing with tragic and confusing news: an opossum has reached its final resting place… just outside my bedroom window. Definitely not playing dead as I know they do, it has been there a few days now. I called animal control but they say they cannot help if it the animal is on private property. I am unsure how to move forward. Is the opossum there with you, wherever you are? What is the best way to honor an opossum’s spirit in a time like this? As it has bit the dust so geographically close to where I sleep and I am not sure of the cause of such a sudden death, it would be nice to know whether any negative energy has been left behind and how I should proceed. Once the opossum realizes that she is actually deceased little time is needed to consider future options.Thank you for your concern. How do I choose a commander of my taxidermy squirrel army? What if we don’t see eye to eye? How do I stop them from rising up against me? Do you like applesauce? I love applesauce. We advise against activating any kind of army, especially squirrel. But you are onto something regarding applesauce. The world does not have enough applesauce. Perhaps you could turn your attention to producing more. please help im going die. Sage advise: If you can’t beat ’em, join ’em. It’s fun being part of the Iluminati. There are costumes and you can play with really cool eccentrics. So stop running and welcome what chases you. Very empowering. And, no, you are not going to die. Not from this, anyway. But do be careful climbing trees which grow at a precarious angle. I am a concerned dog. behaviors with far reaching consequences. 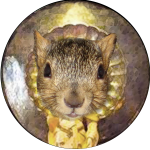 Regular Karma is a dance in the park compared to SACRED SQUIRREL KARMA. We come after your puppies and your puppies puppies and your puppies puppies puppies and their humans. Next time you feel drawn to the chase, just say No. Too hard? Then redirect your attention. I recommend birds. as is the case with small minded, mean spirited, in-bred, caca for brains K9s intent on savaging my multitudinous beloveds. of my squirreletts, you also do unto ME. So don’t! Because if you do, with ME s my witness, you’ll regret the day you were ever whelped. Yo Thomas, not really. 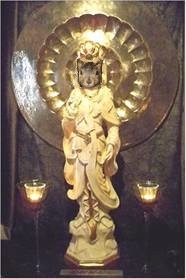 I am an ascended squirrel revealing deep spiritual truths. What you need is earthier and more practical. Put ‘Baby Possum Care’ into your search engine and everything you need to know will be presented. Track down a local veterinarian who does ‘exotics’ and say you have a horse, no, that would be misleading, an opossum. Then program all the pertinent info into your cell phone, including directions, and you are ready to go in an emergency. See if there is a wildlife rehabilitator in your area and maybe get some hands-on help. Possums seem like very simple creatures but their needs are quite complex. Thanks for looking after my little one. Pearl, Mother of all Creation except for the honey badger who wasn’t supposed to turn out like that. Whatever get’s you through the night, Joe. That very much depends on what species you identify as. What do I do with an opossum who jauntily juxtaposes his privy member to others? What do you do if you drowned in a past life? You join the Global Water Dance. Look it up. You’ll be glad you did. Dear mepearl aka your earthly care giver i am writing because i think you need to seek the help of a mental health care provider in the mean time keep entertaining me with you wierd theorys about opossums. Sencirly a very concerded boy. Will there be anymore videos any time soon? I miss you. We noticed that few viewers have seen all 75 videos. This hiatus is intended to give our beloved followers a chance to catch up. Videos go well with spaghetti, herb tea and plenty of cake. Hey Pearl I’ve been feeling pretty depressed lately, do you know any things that could I do to help me feel better about myself? Write down 14 things to be depressed about that have nothing to do with you personally and address those. Think globally, act locally. Feeling better about yourself will result from thinking less about yourself and being active. And feed the squirrels. Always feed the squirrels. And not those cheap peanuts, either. We like raw almonds and walnuts. Dear Pearl. Just wanted to send good vibes and best wishes. My coworkers are not convinced of your excellence, what advice do you have to win them over with you and your opossum? Dearest Pearl,I’ve become a quick believer, your insight has helped a lot. I was wonder if I could print shirts for you! You’ve awoken my long dead, and not playing dead, inspiration for life. You make Pearl so happy. We live to inspire LIFE. As it happens, we have a store http://www.zazzle.com/mepearl where many shirt designs and styles are available. We would be interested in some non perishable vegan ME Pearl spaghetti, however. When you throw it against a tree it must stick. Think about it. Pearl, ever pursuing potential patons. No. But I know an exquisite scholar and tutor who is available for such things. What is the history of the war of 1812? Greed Aggression Revenge and Regret, the history of all wars except the one with my cousin, Lurleen , but that’s a story for another day. I commend your faith in ME to know this and all things. Oh great and mighty Pearl, if you had the ability to die again, would you prefer to be gored by a bull or eaten by a ravenous dog? You are right to seek my wisdom if those are the only options you can offer. You would do well to read more, particularly the classics. As a squirrel I had to eat the classics which can make one irregular, if you catch my drift. This is one of the few instances where you are lucky to be human. Start with Wuthering Heights and Gypsy, then ask ME what you really want to know. Dearest Pearl, I deeply am intrigued in your ways and would like to know how to become enlightened in your work. Everytime I visit you, I find myself crying. I would like to ask you a few questions if that is alright. 1. How did you come to be? 2. Do you have family? 3. What is your favorite Kardashian? Thank You! May your light shine brightly! 1. I invented myself. My greatest achievement. THE greatest achievement. 2. You are all my family, dear ones. 3. Dead dad Robert. He drops in now and again. What a raconteur! Can you help me help people? Help me help people understand why we worship you. Oh dearest Pearl, what is your opinion on billionaires? I approve of their enviable opportunity to shop their brains out at my store: http://www.zazzle.com/MEpearl. Glorious Pearl, where can I donate to the Wildlife Rehab Center you hail from? Good Question. You will find numerous PayPal buttons on this site. They all work. Pearl applauds you. What are the best ways to honor you, and how best could I represent you in my everyday life? I just recieved the pear buttons I ordered to show my support and I am very happy with the product!!!!! Sweetest pearl, what was your favorite event of the civil war? It would have been the masacre of these stupid dum fat ugly twits. ” Aside from some small skirmishes in Northern Kentucky, no engagements were reported. Over the next several days, the Confederate force withdrew, and the Squirrel Hunters were never battle tested. Discharge papers for a Squirrel Hunter. Courtesy of Google Images. Dear glorious Pearl, do you have any favorite movies and also, how do you think the universe came to be to grant us such a inspiring leader as yourself? Well, if you want something done right, do it yourself. And so I did. Favorite movies, ME Pearl videos, of course. Thanks for asking. Always happy to revisit my origin. I’m feeling frustrated with having to “try” around people. It’s exhausting. I just want to show up and be myself with no pretenses, but I don’t know if people really know what to do with that. Women are expected to be polite, accommodating, give compliments, be bubbly, etc, and sometimes I’m feeling very internal and quiet. I get tired just thinking about all the social conduct puzzles and would rather be more in the background, making things for people to enjoy. should I come to terms with needing to try hard at times or acclimate to holding the tension when I don’t feel like adhering to social standards? You are REALLY angry. Own it and express it, preferably while hurling fist-fulls of spaghetti any ol where. Your condition calls for LOTS of spaghetti. Don’t stint. Also, as as squirrel, my go-to move is to bite my opponents really hard. Guaranteed to get their attention. Try it. You’ll like it.